I love a good buttermilk biscuit, don’t you? 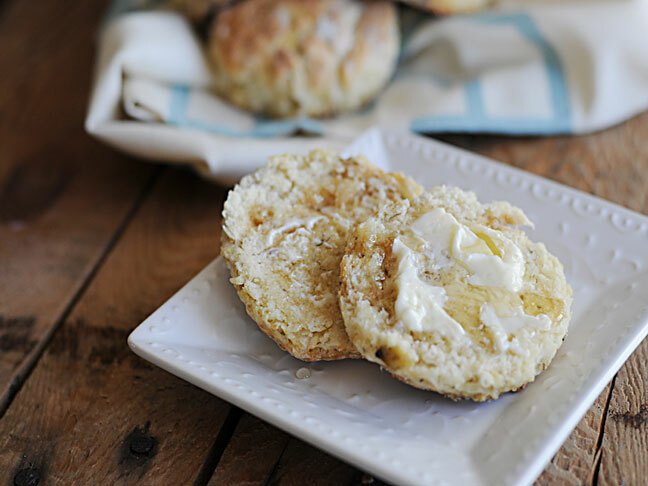 What I love the most about buttermilk biscuits is they are so versatile. You can have them for breakfast with some butter and honey, whip up a batch before dinner to go with the pot of soup simmering on the stove, or use them as the bread for a yummy sandwich. The key to a great biscuit is to be very gentle with the dough and to not over-work it. That is one reason why I love this buttermilk biscuit recipe. The dough is so easy to work with and pats out into a nice, round without the need for a lot of additional rolling or working. If dinner is on the stove and you know what would make it complete is a big batch of biscuits, give this delicious buttermilk biscuit recipe a try! Cut shortening into flour, sugar, baking powder, baking soda and salt with a pastry blender until mixture resembles fine crumbs. Stir in milk until dough leaves side of bowl (dough will be soft and sticky). Turn dough onto lightly floured surface. Knead lightly 10 times. Roll or pat 1/2 inch thick. Cut with floured 2 1/2 inch round cutter. Place on un-greased cookie sheet about 1 inch apart for crusty sides, touching for soft sides. Bake until golden brown, 10 to 12 minutes. Immediately remove from cookie sheet.